You might argue that certain marketing materials can be wildly effective even if they’re not perfect. Wholesale menu printing is not one of those things. Every last detail must be absolutely perfect on a restaurant menu, as customers closely examine every single detail. If the font is light-colored, customers may have a hard time reading it, and if menus are not printed in high-resolution, they’ll appear low quality. Plus, if your customers want pictures on the menu, poor-quality images may turn diners off from the food. People are very choosy with what they eat and most restaurants face a great deal of competition, so your customers may only have one chance to get it right. It’s important to partner with a seasoned restaurant menu printing provider who can offer the expertise needed to create a visually stunning finished product. The Color FX Web team has the knowledge needed to produce restaurant menus of the highest quality. We have a great deal of experience producing restaurant menus of all shapes and sizes, so your customers are definitely in good hands. Many companies automate most of their core functions, including customer service. It’s beyond frustrating to submit an order for something as important as wholesale menu printing and not know if you’re doing it correctly. If you choose to partner with Color FX Web, you’ll never have to worry about this. We firmly believe in personalized customer service. From the very first time you contact us to submit a wholesale menu order, you’ll work with a real live person. Our team places a huge emphasis on quality. 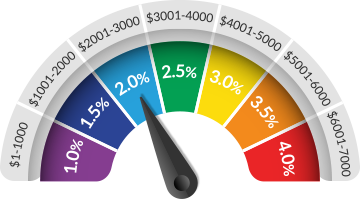 You can contact your dedicated account representative at any time during the printing process, with any questions or concerns that arise. 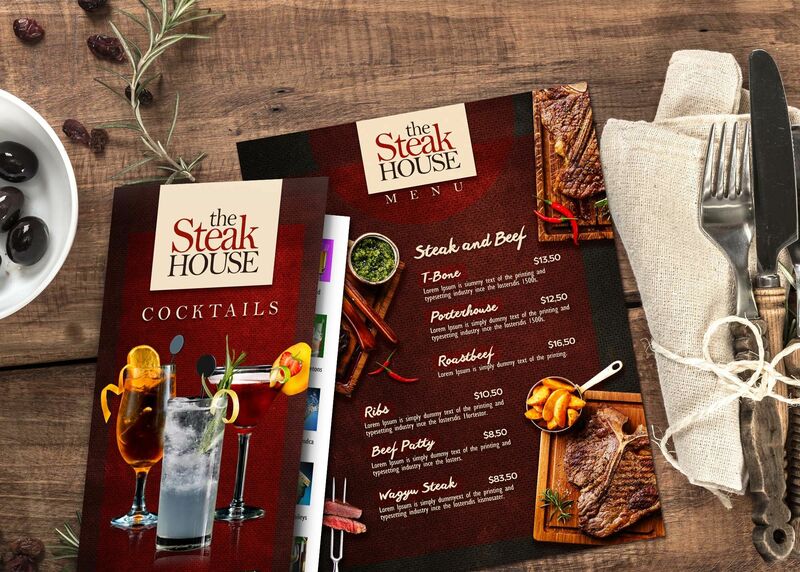 We understand how important menu printing is and we strive to make it as easy as possible to get in touch with us. Your customers deserve flawless restaurant menus. Choose Color FX Web to deliver a finished product that guarantees satisfaction! 8.5"x11" Menu Printing: Printed Full Bleed on 100# Gloss Book with AQ or Dull (Princess Silk) Coating OR 70# Offset without Coating, cut to 8.5"x11". 11"x17 Menu Printing: Printed Full Bleed on 100# Gloss Book with AQ or Dull (Princess Silk) Coating OR 70# Offset without Coating, cut to 11"x17" and trifold to 11"x5.6". 8.5"x11" Menu Printing on Cover Stock:Printed Full Bleed on 100# Gloss Cover with AQ, U.V. (Royal Shiny) or Dull (Princess Silk) Coating, cut to 8.5"x11". 11"x17 Menu Printing on Cover Stock:Printed Full Bleed on 100# Gloss Cover with AQ, U.V. (Royal Shiny) or Dull (Princess Silk) Coating, cut to 11"x17", score and trifold to 11"x5.6". Mailing Services fee for Menus: List processing fee of $45 for one list and $15 for each additional list, $79 per 1000 Inkjet charge and a postage fee (refer to our Direct Mailing section for details). 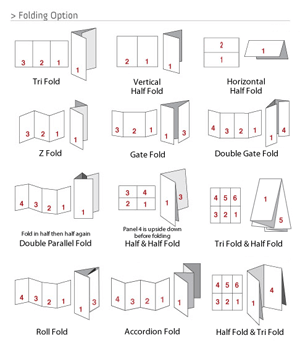 Folded flyers are eligible for Letter Rate, depending on the final/folded size. Tabbing: Folded brochures must tab closed to mail at automated postal rates. Single tab is required if tabbing at top of mailing panel, double tab if tabbing at bottom. Tabbing edge must be parallel to the folded bottom edge. 8.5 x 11: 100# Gloss Cover, Tri-Fold: 2,500 qty. - 1,250 per box - 2 boxes @ 28lbs. = TOTAL weight of 55lbs.